Exercise and eating often go hand in hand. If you are watching your weight or just trying to be as fit as possible, you are probably boosting your exercise time and cutting back on portion sizes. Knowing how to schedule everything together for an ideal lifestyle can be confusing. Whether or not you exercise on a full stomach is really a personal choice. Only you know how you feel during a workout, and you alone must tailor your lifestyle to your needs. 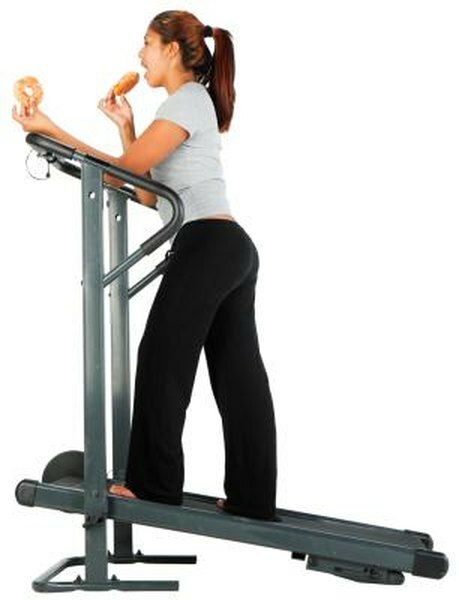 Exercising on a full stomach might hamper weight loss if this is one of your main goals related to working out. Peter Hespel, a professor at the University of Leuven in Belgium, explains that your body breaks down fatty acids more readily when your body is experiencing low insulin and high adrenaline at the same time. If you eat a large meal and therefore have a full stomach directly prior to your workout, your insulin levels will be higher and will not contribute to a faster fat burn. "Full stomach" is a relative term; what one person considers a large meal is another person's snack. Even if you are looking to lose weight, a physical workout on a completely empty stomach may not be an option. When your insulin and blood sugar levels are too low due to fasting, you can begin to feel weak and shaky, which can impact your workout and overall safety. In addition, you may not be able to concentrate on your activities if you are feeling very hungry. Timing is everything when it comes to eating before exercising. A large meal, such as a full breakfast, lunch or dinner, is best eaten at least three hours prior to a workout, and preferably four hours beforehand. This gives your stomach time to begin the digestion process before you exercise without making you feel sick. Smaller snacks can be eaten within an hour or two of running, swimming, playing sports or participating in strength training. The small amount of food gives you energy to complete your workout without feeling bloated, slowed down or nauseated. A combination of carbohydrates, produce and protein can fill your stomach enough to keep you moving comfortably during your workout. Granola bars; whole-wheat toast or bagel with peanut butter or cream cheese; whole-grain cereal; fruit; or yogurt are ideal snacks to consume before you exercise. Pack an energy bar if you run long distances and are afraid your breakfast will not tide you over. Fatty, greasy or otherwise heavy foods should be avoided before exercising; these items tend to irritate your stomach even when you are at rest and digest more slowly. You are more likely to experience discomfort if you have eaten a large fast-food meal, for example, directly before your workout than if you eat a bowl of oatmeal. The oatmeal is high in fiber, which keep you feeling satisfied for a longer period of time and digests more easily as well. Hydration is an important part of exercise. Drinking plenty of water before, during and after your workout is a good way to keep the hunger pangs away and avoid dehydration. Don't forget to eat a little something in addition to drinking before you exercise to give you energy. The extra fluids -- at least two cups of water several hours before an intense workout, plus more water while you exercise is recommended by the American College of Sports Medicine -- will take away your hunger to some extent but will not give you the energy boost that protein and carbs will do.